Welcome back. Several years ago, I began a blog post by describing a monthly newsletter I produced in the 1970s and early 1980s while in academia (Research Sponsor Bias). That pre-internet era newsletter was mimeographed, stapled and mailed to about 500 individuals across campus and in some 45 states and 15 countries to provide updates on our academic program and other relevant items. I can’t recall a single detail about the article, capsule or developers, yet I remember the title because another newsletter--the newsletter of a non-US government organization no less--copied my article and title. At least someone appreciated my humor. Development hasn’t been fast, but ingestible electronic capsules or pills are now rapidly evolving with applications including optical imaging, sensing body vital signs, ensuring medication is taken and drug delivery. A camera inside a capsule that captures and transmits images as it travels through the esophagus, stomach and duodenum (from www.medtronic.com/covidien/en-us/products/capsule-endoscopy/pillcam-ugi-system.html). One of the latest examples was described in a paper by researchers affiliated with MIT, Draper University and Brigham and Women's Hospital. Their new device incorporates features that members of the research team designed for earlier ingestible sensors and drug delivery capsules. Advances in multi-material 3-D printing enable their device to survive in the gastric environment for about a month and maintain about two weeks of wireless electronics communications before breaking down and passing through the digestive tract. After being swallowed, the device unfolds into a Y-shape that can carry drugs as well as sensors to monitor and relay information. 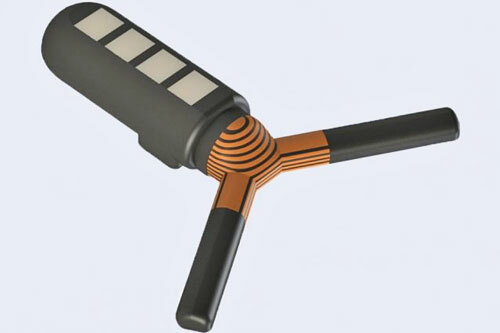 Ingestible biomedical electronic device (from onlinelibrary.wiley.com/doi/abs/10.1002/admt.201800490). One arm of the device has four compartments that can be loaded with drugs. The drugs can be packaged for gradual release over days or be released if infection, allergic reaction or other events are sensed. The compartments could be designed to be opened remotely with Bluetooth wireless technology. The prototype device is powered by a silver oxide battery; however, alternative power sources are being explored, including stomach acid. Although the researchers have designed sensors for monitoring vital signs such as heart rate and breathing rate, the reported study focused on temperature. Testing the device in pigs, they demonstrated the capability of monitoring and relaying temperature to a smartphone within arm’s length. The short distance is driven by desired security. The researchers hope to begin testing in humans within about two years. [T]he synergistic integration of reconfigurable gastric-residence structure, drug release modules, and wireless electronics could ultimately enable the next-generation remote diagnostic and automated therapeutic strategies.